NBN is still doing copper the last mile. Copper is copper. The ADSL service would have run on copper (ADSL is fixed/dedicated infrastructure, the only time you lose performance is cable (not foot) distance from your premises to the nearest Exchange. Being in world square you are literally a block to the exchanges. Cable must be long though as you should get 18-25 on ADSL copper when you are over the exchange but 15Mbps (capital M).. isn't bad..
On the Optus NBN, best guess based on your symptoms fluctuating is they over subscribed your area. They don't like to give away much but I'd guess the NBN is shared infrastructure at some point and in that case over subscribed. Still if you can get 15Mbps by say 1Mbps upload then streaming anything (like netflix) should be fine. Any tests you do plug a cable into your router, don't rely on the WiFi for testing.. although I'm with you Optus isn't all they are cracked up to be. But 2-5 Mbps on 100 Mbps download speed is not acceptable doesn't matter their excuses!! Worst speed and worst experience- I moved into new house in dec-16 and upgrade my ADSL 2 plus to NBN top speed package and I am facing same issue. In fact on my initial calls they advised sometime it is network upgrade , or some other realeted issues, congestion, and then one day I was advised bcoz my NBN box is garage and I got weak WiFi signals so I am getting low speed. They advised my to get WiFi extender, I got two! But still speed did not improve, then they advised WiFi does not get the speed, Ethernet does.. Than I have to get DATA point in my house where I can connect my laptop with Ethernet cable to get the speed, even then I did not get the speed, and now the reason is back to network upgrade so from last 6 months I am facing this issues. So finally I called up 2-2.5 week ago and complaint and they told me I will get a call from Supervisor and I told them I am not going to pay a cent unless I hear back from them. I was advised I will get a call within 24-48 hours which never happen and then when I called back my call was handles with such a rude way.. I can not even explain, my bill got over due since I did not hear from optus supervisor and I did not pay! So when I called back to seek credit for the late fee, they said I am among all other customer and they refuse to give credit for the late fee and when I asked to give me in writing they sent me letter stating they refuse to give credit for bill ! Paid $184 for two mobile and NBN connection with home line, and I am with optus since 2008! Can some one please advise as what my rights are .. 6 months and no speed on the top pack! I am just disappointed the way my query is handled and I am never been able to enjoy the smooth speed and I am paying $184 per month to optus from home telecommunication and internet services. @ClydeNorth, I'm sorry that you've had trouble your bills and connection there It's a shame to see. If you can PM me with your account number, full name and DOB - we'd be more than happy to take a closer look at what's going on and assess what your options would be. 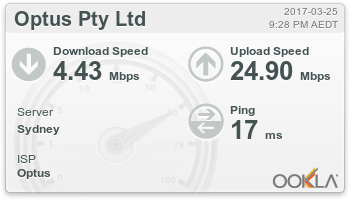 Hey "DUDE" I live in in a smallish town of around 10,000 people and I have FTTP. Explain why my speeds are even lower than those mentioned above. This company along with some other Aisian based companies have setup bodgey poorly serviced operations on our shores. Im not racist I just believe these unscrupulous companies do this stuff and our politicians do nothing to stop it as most of them are in bed with them. TOTALY AGREE!!!!! WORST MOBILE AND NBN PROVIDER I HAVE EVER SEEN!!!!!!!!!!!!!!!!!!!!!!!!!!!!!!!!!!!!!!!!!!!!!!!!!!!!!!!!!!!!!!!!!!!!!!!!!!!!!!!!!!!!!!!!!!!!!!!!!!!!!!!!!!!!!!!!!!!!!!!!!!!!!!!!!!!!!!!!!!!!!!!!!!!!!!!!!!!!!!!!!!!!!!!!!!!!!!!!!!!!!!!!!!!!!!!!!!!!!!!!!!!!!!!!!!!!!!!!!!!!!!!!!!!!!!!!!!! !